Manila Water Foundation (MWF) in partnership with Fundacion Altadis and the Provincial Cooperative, Livelihood and Enterprise Development Office (PCLEDO) made it possible for more than 12,000 cooperative members to look forward to a better future through a program which aims to empower communities and to help achieve sustainable development via provision of non-interest loans and capacity building mechanisms. Through its Kabuhayan Para Sa Barangay program, MWF formally turned over a total of Php 1.9 Million soft loan, which was generously donated by Fundacion Altadis, to 19 community based cooperatives in Cavite on August 26, 2016 at the Provincial Capitol of Cavite in Trece Martires, City. Each of the cooperatives received a non-interest bearing loan amounting to Php 100,000 which can help them fund their small to medium enterprises. Through this non-interest bearing loan, it will be possible for cooperatives like Golden Heart Multi-Purpose Cooperative to venture to new businesses and provide better services to its members. According to its Founder and General Manager, Leonardo Collamat, this partnership can help the cooperative open a rice trading business which can address the basic needs of its members. “Very timely ang pagdating ng loan mula sa Manila Water Foundation. Makakatulong ito dahil ‘yan (bigas) nga ang pinaka primary need ng mga members,” (The loan from Manila Water Foundation was timely. This will help us open a rice trading business which can address the primary need of our members which is food.) he shared. Golden Heart Multi-Purpose Cooperative Founder and General Manager Leonardo Collamat, one of the partner beneficiaries of the KPSB program, shared that they will open a rice trading businesses with the soft loan they received from MWF. Also in this photo are (from left to right) Laguna Water Company Regulatory and External Affairs OIC Real Magtangob, Fundacion Altadis Country Representative Carlos Saez-Diez Reberdito, MWF Exceutive Director Carla May Beriña-Kim, a member of the Golden Heart Multi-Purpose Cooperative, Cooperative Development Authority Assistant Regional Director Bernadette Hornilla, and PCLEDO Head Alvin Mojica. “Yung mga kasapi namin na may negosyo na kainan, napalakas nila yung kanilang negosyo dahil sa supply ng bigas. Mayroon din kaming kasapi na nagkaroon ng negosyo dahil sa bigasang pangkabuhayan [ng kooperatiba],” (Some of our members who are into food business were able to make their businesses grow via the affordable and steady supply of rice. Some were also able to put up their own businesses because of the rice trading business of the cooperative.) he proudly stated. General Manager Ronaldo Sales shared Kingsland Pala-Pala Multipurpose Cooperative and Transport Service’s success story after being granted with a Php 100,000 soft loan from MWF. Just six months after the receiving the loan, the cooperative was able to venture into three different businesses and also help its members establish their own enterprises. Sharing the same vision, partner cooperative Parishioners Multipurpose Cooperative Chairman Severo Garcia thanked MWF for its efforts to bring a holistic development for the communities it helps. “Natutuwa ako dahil yung Manila Water Foundation ay may social concern na ang development ay hindi personal [lamang] kundi dapat ay sama-sama nang maramdaman ng lahat,” (I am glad with Manila Water Foundation for its social concern of achieving not only personal development but also development for all.) he gratefully quipped. Parishioners Multipurpose Cooperative, one of the partner beneficiaries, shared through their Chairman Severo Garcia the mission of cooperatives which is to serve the community above earning profit. 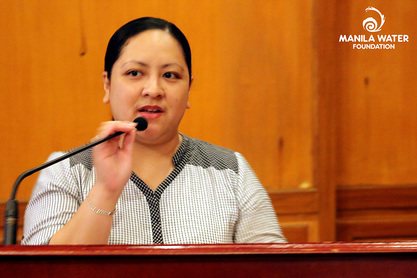 This vision was articulated by MWF Executive Director Carla May Beriña-Kim during the memorandum of agreement signing which happened a week earlier. “Kami po sa Manila Water Foundation, gusto naming tumulong sa nation-building. Gusto po namin lahat, simula sa pinaka-simple, aangat po at aangat,” (Manila Water Foundation wants to help in nation-building. We want to see that even the simplest man can one day attain prosperity.) she stressed. 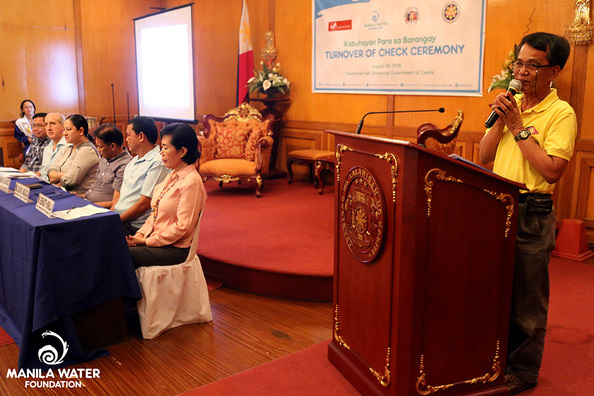 MWF Executive Director Carla May Beriña-Kim led the check turnover last August 26, 2016 at the Provincial Capitol of Cavite in Trece Martires City. Even after the overwhelming gratitude the partner cooperatives expressed for the Foundation, the Executive Director did not fail to thank all the partners who made the KPSB program a success. ​During the check turnover, on the other hand, the Executive Director thanked all the partners who made the KPSB program a success. Aside from Fundacion Altadis, she also expressed her gratitude to the Provincial Cooperative, Livelihood and Enterprise Development Office and the rest of the Provincial Government of Cavite for helping MWF mobilize community-based cooperatives to take action for sustainable and inclusive growth.